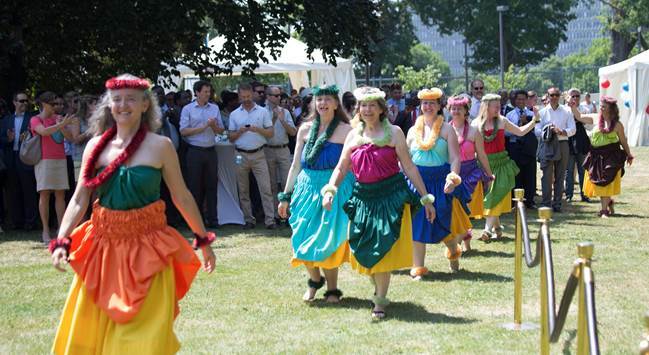 Dancers of Ka ’Imi Switzerland, Germany and Austria performed at the permanent U.S. Mission to the United Nations in Geneva, Switzerland on July 7th 2015, on occasion of the celebration of Independence Day 2015. The theme of this afternoon was Hawaii and the “Aloha Spirit”. 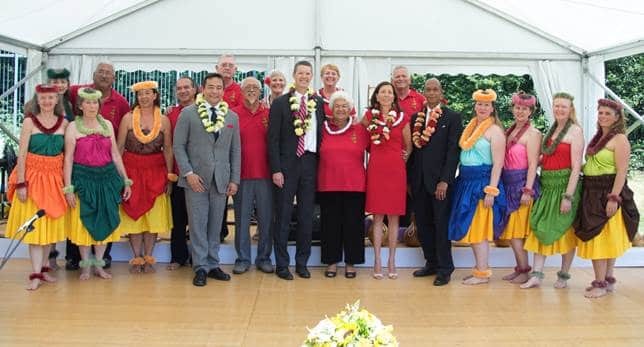 Ambassador Pamela Hamamoto (grown up in Hawaii) invited the Band Na Ohana Ho’aloha from Moloka’i to play for the reception and suggested that a Swiss Hula Halau should participate to make the connection to the guest country and to enhance cultural exchange. Ka ’Imi picked up the invitation and participated with dancers not only Switzerland but also from our German and Austrian Halau. 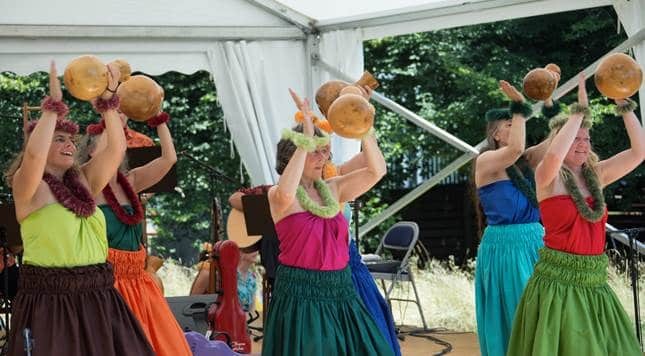 Manja from Switzerland and Anna from Germany visited the band on Moloka’i in February 2015 and got a first taste of dancing with the group during one of their weekly shows at the Paddlers Inn. After a lot of preparation we all met in Geneva on Sunday July 5th starting rehearsing in extreme summer heat. Everybody put their full effort into getting the dances tuned up, making leis for us, for guests of honor as well as for some of the U.S. Mission staff. Monday July 6th we went to the U.S. Mission to rehearse with the band. We only had this one day to get to know each other, finding the same rhythm, pick the right versions of the songs, agree on verses, beginnings and endings. It was an intense and exhausting rehearsal. But it was worth it: The next day nobody could believe that this was the first time we all met and played and danced together. The staff of the U.S. Mission welcomed us kindly and took care of us with food and water. Another hot night and most of us had trouble to sleep again. But next morning July 7th everybody was ready and eager to start. We arrived early with all our equipment and mountains of dresses at the Mission, did some last checks and soon changed into our long dresses. The day was to be the hottest day ever in Switzerland on the Northern side of the Alps! 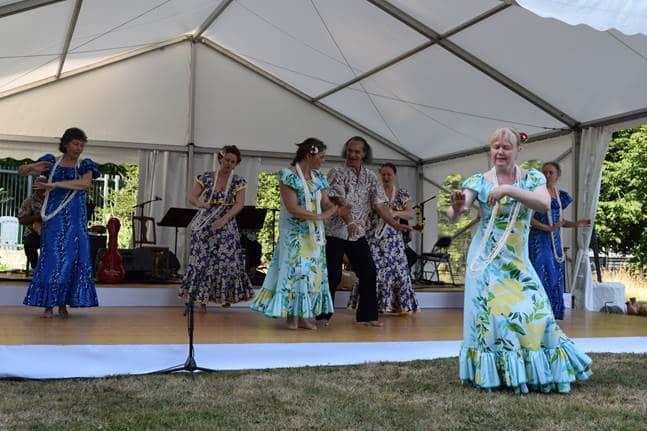 About 1’200 diplomats from over 170 countries gathered and later gave very positive feedback on this year’s celebration: the combination of the Ambassador Pamela Hamamoto’s speech about spreading the spirit of Aloha, the Hawaiian music and the Hula dance was very well received. Some even said it was the best program they’ve had for a long time. What many of us found surprising was that obviously people were following the program from the sides and back, although nobody was able to stay directly in front of the stage as this area was in full sunshine the whole day, and therefore unbearably hot. It started with the guests coming in, being greeted by the four Ambassadors in the reception line. The band played during this time, we gave our leis away according to the protocol and then started our first set dancing in our long dresses. As the gates closed the core of the celebration started with a Marine Honor Guard presenting the colors and a quartet of State Department officials singing the National Anthem. We were still up in the building rushing and changing into our Pa’u costumes, then coming down again during Ambassador Hamamoto’s speech and exactly when she was saying “…and I’m thrilled that we are also joined today by a Swiss hula halau with dancers from Switzerland, Austria and Germany….” we entered the area coming back down to the stage, giving her the opportunity to introduce us with: “and here they are, by the way”. Then we could listen to her speech and were asked to pose for some pictures with her. Afterwards we started our kahiko set with Aloha Tatou. A hot and stormy wind came up, blew into the microphones so it sounded like thunder! The third set was a little more relaxed but everyone suffered from the extreme heat. The temperature was rising up to nearly 40 degrees Celsius (more than 100 F). Not so many guests were staying into the afternoon heat, but the ones who did really enjoyed more music and dancing. Encouraged by the band they had fun dancing Hukilau and Hawaiian Hoki Poki. Once everybody had left we finally could sit down and eat a little. Completely exhausted but very happy and content we went back to our sticky and hot hostel rooms and going out for dinner at an Italian restaurant. And there was even some rain!! The next day we had a second shorter performance in the afternoon – same place, different audience. We were still tired even after sleeping in a little. Luckily the temperature dropped and the dancing in the early evening was very different. It was short, people enjoyed the music and dance. And again we got extremely positive feedback and had many interesting and friendly meetings. For us European dancers it was a great experience of working together. We were joining our dancing, our efforts and our spirits! It is just great to experience again and again how we can weave a colorful fabric. We are very grateful for our Kumu Roselle Bailey’s in-depth teaching and founding vision of the Ka ‘Imi Institute, as they allow us, all branches of Ka ‘Imi, to come together, perform and dance as one body.